I guess the title says it all, if you're looking for the short description. There's always a back story with me so hold on for the ride. I wanted a Pizza, but really this can be used to make most basic breads. I did not want to fuss around with a "full batch" of dough and make a cookie sheet full of rolls and ... well you get the picture. I will say that this will scale up to a larger batch and should be limited by how strong your own hands are. You see, it's all about your grip strength. If you've got arthritis or some other limitation, use the machine. On the other hand, this dough flew together so fast that it's a great way to make fresh dough for small batches like one pizza dough ball or a couple of rolls. Basically, I have a "Standard Recipe" for bread. It's "Pat's Pizza Dough" recipe. It makes 10 sandwich rolls, or about 8 torpedo rolls. It also will make three pizza dough balls. The original recipe is at the link - or you can even see my original note written 20 years ago in the picture. The idea was cut the recipe down to one third of normal, then make it in a bag. I added to a clean and food safe plastic bag the following ingredients. Squeeze most of the air out of the bag and wind the top up to close it. Grip the mix at the bottom of the bag and squeeze it repeatedly. The mix will eventually form a dough ball through repeated kneading. You may have to adjust the water content to fit your needs. Bread dough is effected by the weather and conditions in your house and kitchen just as you would expect. 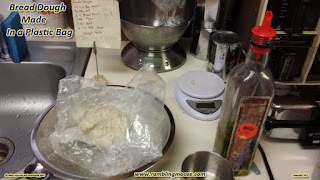 Wet climate will make stickier dough, dry climate you may need to add more water. For Pizza Dough, you need a dough ball that is more dry than tacky or sticky. Similar to Play-doh or similar modeling clay compound. For Bread Dough, you need a dough ball that will be a bit tacky and it may want to stick gently to your hands or the side of the bag - but you will be able to remove it from the bag. Basically that's about it. I'll use this again because it's saving me a lot of time in preparation and clean up work. But... it took me just five minutes to get this dough done. Add to it rolling time and rising time as normal.